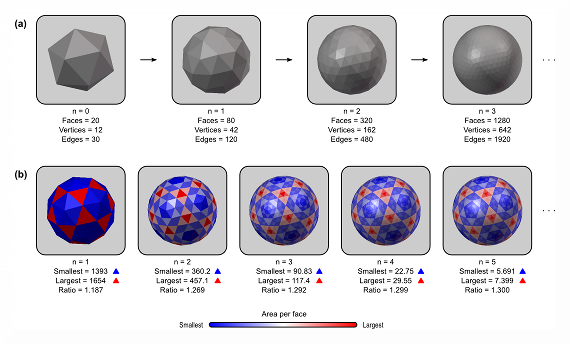 A script to create platonic polyhedra, with recursive subdivision | Brainder. Suppose you need a tri-dimensional file that contains a platonic polyhedron, say, an octahedron or an icosahedron, stored as a mesh. This file should, however, meet certain criteria: be in an useful format that can be imported into modelling applications, such as Blender, and be easily manipulable using scripts in languages suited for numerical computations, such as Octave or R and perhaps even be manipulated directly from the shell, using, e.g., gawk. To meet these demands, below is a tool that creates any of the five platonic polyhedra in Wavefront Object format, with the *.obj extension (in ASCII). The user can specify the desired edge length, the area of the face, the total area, the total volume, the radius of the circumscribed sphere, or the radius of the inscribed sphere. 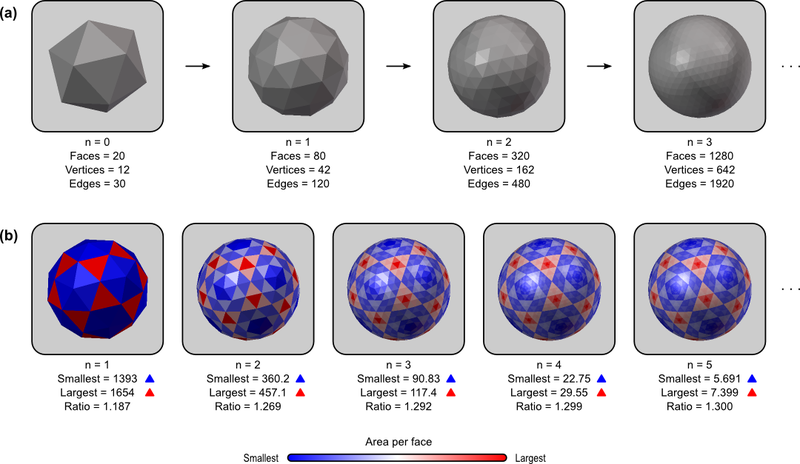 The tool also allows recursive subdivision of the faces of the polyhedra that are made of triangular faces (tetrahedron, octahedron and icosahedron). The subdivision implemented allows geodesic spheres of Class I (Kenner, 1976) to be produced easily. It is also possible to apply affine transformations to the coordinates of the vertices, so that the resulting mesh can be scaled, translated, rotated and sheared in any direction. Finally, it is possible to randomly perturb the vertex positions, so that the mesh becomes irregular, yet preserving the original topology. (a) A geodesic sphere can be produced from recursive subdivision of a regular icosahedron. At each iteration, the number of faces is quadruplied. (b) After the first iteration the faces no longer have regular sizes, with the largest face being approximately 1.3 times larger than the smallest as n increases. The figure above and the formulas have been discussed by Winkler et al., 2012.
platonic – This is the Octave script. Simply download it, change the first line to point to your correct Octave location, make it executable, and run it directly from the shell. Call it without arguments to obtain usage information. platonic.m – This is the same as above, but can be executed from within Octave or MATLAB. Type ‘help platonic’ to obtain usage information. subdivtri.m – Add this to your Octave or MATLAB path. The obj2srf command is available in the package for areal analysis, here. Kenner H. Geodesic math and how to use it. University of California Press, Los Angeles, USA, 1976. This entry was posted in Neuroinformatics, Surface models by A. M. Winkler. Bookmark the permalink. Could you please add an example on how to produce and ico7.srf with platonic, which is used with area interpretation? Sure, I just updated with an example. Hope it helps. Pingback: Displaying vertexwise and facewise brain maps | Brainder. Pingback: Fast surface smoothing on a common grid | Brainder.